Yu, Jiyuan. The Ethics of Confucius and Aristotle: Mirrors of Virtue. New York: Routledge, 2007. There are dangers with comparative philosophy. These include incommensurability, relativism, misinterpretations and heavy reliance on secondary sources (language), and Eurocentric standards. 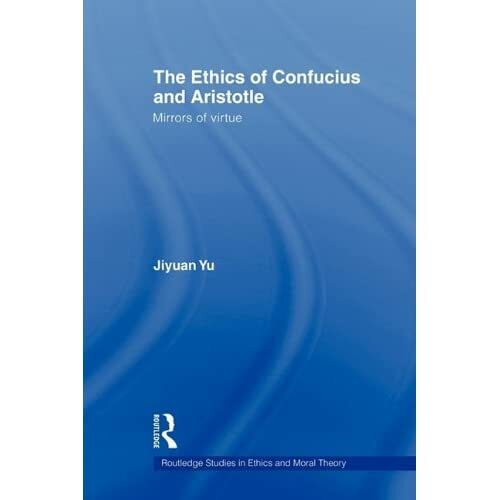 Jiyuan Yu faces all of these and tries to minimize each problem in his work comparing the ethics of Confucius and Aristotle beginning with addressing Alasdair MacIntyre’s concern about comparative philosophy. Yu suggests that both Confucius and Aristotle address core issues of being human. This type of claim has its own problems but Yu does work throughout his book on setting up a dialog of understanding of the two systems and even how they may address shortcoming in each other systems. Yu uses Aristotle’s own idea of friend as a mirror thesis as a basis for this type of comparison (p. 4). Yu helped me with my own understanding of Confucius’ ethics by comparing it with Aristotle’s for which I was more familiar. Most helpful was Yu’s comments on the different kinds of ren. There is a general sense that means human excellence and a particular sense of benevolence. I am not sure if I am on firm ground with these different concepts because of my heavy reliance on secondary source (note this is one of the dangers of comparative philosophy) for Confucius but I am better able to appreciate the subtleties of Confucius thoughts. The author’s discussion of habit and ritual also provide me with much to think about. In fact, Yu pointed out many places of comparison that I would not have look towards. The Ethics of Confucius and Aristotle has both a Greek and Chinese glossary. There are plethora of notes, selected bibliography, textually grounded discussion, index of names, and index of subjects. As a scholarly work, Yu has everything that I want. The thematic base of the chapters is helpful and Yu returns to ideas that he has built upon earlier. This entry was posted in Book Review, Philosophy and tagged Aristotle, Confucius, Ethics, Philosophy. Bookmark the permalink.